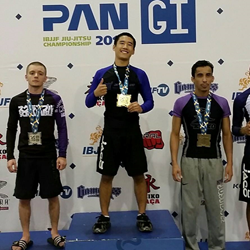 Christopher Duyquan Tran defeated three opponents to win the Gold medal at the prestigious No Gi Pan competition. Christopher Tran defeated three opponents this past Saturday to claim first place in the Purple Belt Rooster division of the No Gi Pan competition. Tran, a Purple Belt in Brazilian Jiu-Jitsu, is one of Maryland's most decorated BJJ competitors, having won the World Championships at the Juvenile Blue Belt level and taking Silver at the Adult Blue Belt level. In No-Gi competitions, Tran has also excelled, winning the No Gi Pan last year in the same division. "It was my birthday on Saturday and this was one of the best birthday presents I could have received," says Tran. Chris Tran is currently a Business major at University of Maryland - College Park. Despite being a full-time student, he tries to train when he can at Crazy 88 Mixed Martial Arts in Elkridge MD. He also runs a College Park based Brazilian Jiu-Jitsu club for students of the University. The No Gi Pan is an annual competition run by the International Brazilian Jiu-Jitsu Federation (IBJJF). The event takes place in New York City and is considered the 2nd most difficult No Gi Competition run by the Federation. The IBJJF is the governing body for the major grappling tournaments in the world, including the World Championships, Pan, European Open, and the Brazilian Nationals. Crazy 88 is a mixed martial arts program with locations throughout the Baltimore area. They teach Brazilian Jiu-Jitsu, Mixed Martial Arts (MMA), Boxing, and Kickboxing. Find out more at http://www.WholeMonthFree.com or call (443) 283-1450.